Keeping lizards or snakes in captivity was once restricted to serious herpetologists (as they saw themselves)/weird eccentrics (as many others saw them). However, in recent years having a pet leopard gecko or a bearded dragon is becoming pretty mainstream. 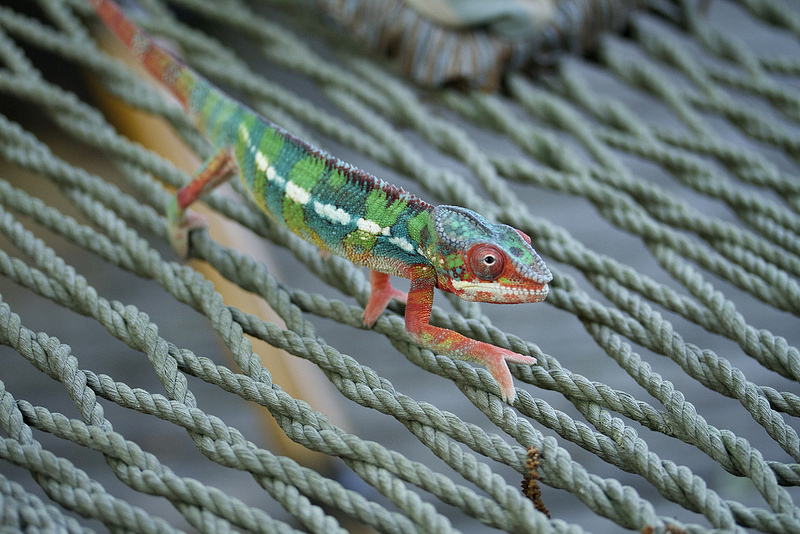 If you are considering a reptile pet, you need to do a lot of research about the species you intend to keep. First however, you really need to decide whether sharing a house with a lizard or a snake is for you. I’ve kept geckos for years and below is my take on the good, the bad, and the ugly on reptile pets. Of course these points are very general. Each reptile species also has its own very specific characteristics, which some people like and others hate. In addition a lot of the points can be good or bad, depending on your point of view. The are hypoallergenic. I think the increased incidence of allergies to cats and dogs goes some way to explaining the increasing popularity of keeping fish, frogs and reptiles. Many of them don’t need a lot of space. Of course this depends on species, iguanas, water dragons, some snakes and tortoises, will grow to require a large terrarium. However, many species only need a 20 gallon terrarium, in which they will spend their whole lives. You can keep them even if you only live in a small apartment. They don’t make loud noises and they don’t smell. Many of the smaller types of pets, like rodents and birds do have these problems. I still remember waking up early in the morning to the loud screeching of guinea pigs demanding their breakfasts. And the parrot I had as a child was not exactly quiet either. Of course birds or hamster cages shouldn’t smell either, but in my experience it takes a lot less work to keep reptile enclosures clean and odorless. There are many “beginner” species that are very easy to keep. If you are afraid to get your first cold-blooded pet because you think they need a lot of specialized equipment and knowledge, don’t worry. Many are very hardy and easy to keep. Yes you do need to research whatever animal you are planning to get, and buy the right equipment for it, but if you do your work before you get your pet, you can get years of enjoyment from it, without much effort. Lizard species that are particularly recommended for beginners include the leopard gecko, the crested gecko and bearded dragons. You can order everything you need to setup their enclosures on Amazon! They don’t bond with humans. That’s actually a negative point (see below), but if you spend most of the days outside of home, then keeping a dog or even a cat that requires human contact is cruel. Reptiles do actually need a bit of looking after ever day, but as long as you make sure they are fed and watered, they won’t care if you are not around. Most vets are clueless when it comes to reptiles. Again this can be a negative point, however, you will almost never need to spend money on vet fees for your pets, unlike dogs or cats. Whenever you can buy captive bred reptiles, which do far better as pets than wild caught ones. Last but definitely not least, they are beautiful fascinating creatures. It is a great pleasure to have a piece of Madagascar or Africa in your house and observe these animals going about their business. Herpetology is an absorbing hobby, you will probably start frequenting forums, possibly end up going to reptile shows, get to know other reptile-keepers. There are few things that give as much pleasure as having a specialist hobby and interacting with other like-minded people. The Cons of Reptile Pets. 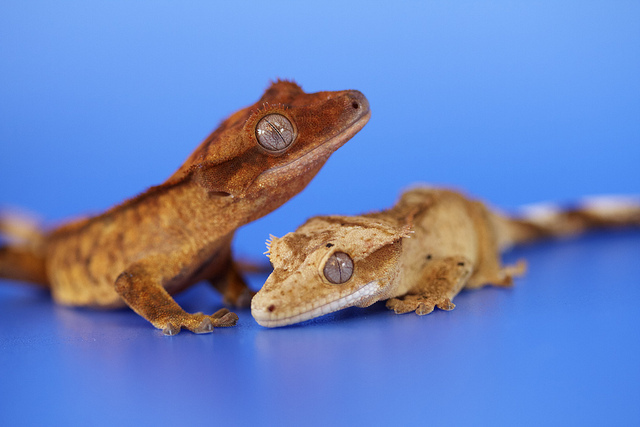 Crested geckos can be kept without live food, they are also fairly easy to keep, can be handled and are very cute. photo by Florence Ivy under the CC BY-ND 2.0 licence. that you will have to keep them in your house as well. Some people prefer roaches as feeder insects, not that they are any nicer. Crickets can smell (mine actually don’t, I guess it depends how you keep them). They will probably escape and wander around your house screeching their horrible, loud love songs (I’ve found roach motels to be the best way of controlling the escapees). The bigger species might require pinky mice, which is even more horrible. There are a few species that are strictly vegetarian (turtles) or that can be fed on a specially prepared powder, like crested geckos. They will not bond with you like a dog. Actually, I firmly believe that my geckos know and love me. How do I know this? Well, if I am in alone in their room, they will bask in the open and run around their tanks naturally. Whenever somebody else comes into the room, they hide, and are nowhere to be seen. Some of the small, easy lizards are quite calm and can be handled, for example leopard geckos or crested geckos. The day geckos that I keep, should not be held, they have very delicate skin and are very fast and nervous. Some reptiles, like chameleons, are very easily stressed and should not be handled much. Most vets are clueless about reptiles. If your pet becomes ill, especially if it is one of the small species, you are likely to find more help on specialist forums than from a vet. Some problems, like difficulties in shedding, usually from a low humidity, you might be able to solve yourself. However a serious illness can often be fatal. The good point is that if the terrarium is setup appropriately and their diet is good, many reptiles are very hardy and can live for years without health problems. You can’t leave them for long alone. If you are going to be away longer than 24h than I need to arrange for your reptiles to be cared for. Unfortunately, even if you are going somewhere that would allow pets, you can’t really take them with you. Keeping reptiles is addictive. Unless you have exceptionally strong will power, you run the risk of being overrun with lizards. There are so many species, sticking to just one seems impossible. I started out with klemmeri day geckos, then I expanded into cepediana. I promised myself that it would end there, but when my reptile dealer had some electric blue geckos available, I just couldn’t resist. Now I feel that life is just too grey without a panther chameleon. Where will this end? I really want a panther chameleon! photo by Florence Ivy, under the CC BY-ND 2.0licence.